After twenty-four hours of racing in north-westly and westly winds accompanied by chaotic seas the Minis have at last begun to see some pleasant sailing conditions. 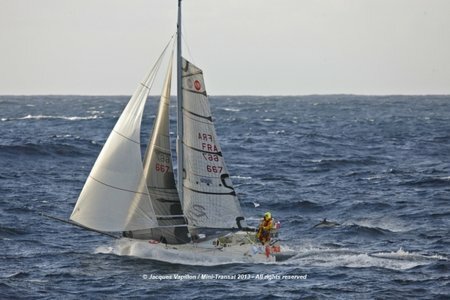 Between the excitement of the start, the stress of the weather conditions and the reality of life aboard, many competitors have suffered from seasickness during the initial hours of the race. The wind is dropping and the pain is easing so now the tactical battle begins. Driving the boat at full pace during the first hours of racing was not for the feint hearted. And it is surely no coincidence that, in both the prototypes and the series boat, that we find the big guys, who can take what ever is thrown at them, are in the lead. Just before the start, Ian Lipinski (Pas de Futur sans Numérique ) said : “We will play it tough, just like the Glénanaise … “. A product of the training of this famous sailing center, Ian admits that these extreme conditions are something of an advantage for him, as he is accustomed to sailing the hard way. It is also no coincidence that in the series boats those in the lead are the sailors who have completed the most sailing miles during the past two season. For example Jonas Gerkens (Netwerk 2), Renaud Mary (www. runo.fr ) or Aymeric Belloir (Tout le Monde chante contre le Cancer)). In these specialist conditions, the wheat is quickly sorted from the chaff. It’s the same situation in prototypes, which are still led by the impeccable Giancarlo Pedote (Prysmian). Clinging to his heels is the trio of Gwénolé Gahinet (Watever Longways) , Nicolas Boidevezi (Nature Addicts) and Julien Pulvé (MEXT -ICA), three sailors known for their larger than life characters. The first twenty-four hours were not necessarily the most technical, but they have been a test of character. The battle that now opens up will be of a different nature. With a southwesterly regime in place they have to make choices. Heading west to take advantage of the pressure gradient is also taking the risk of facing unstable winds as the next front approaches and having progress slowed by difficult cross-seas, which are hard to negotiate for the 6.50m. Going south is playing the safety card and hoping to find an easier sea state in the lee of the Cantabrian coast. However, this comes with the certainty of facing very unstable winds in both direction and strength, as well as having to face one long single tack west at the end of the leg. But as we all know, sailors rarely like to bang the corners and this route does not leave them much tactical choice if there are unexpected wind shifts. Faced with this dilemma, the soloists will choose their route based on various factors : their ability to read and anticipate the coming weather changes, the potential of the machine and the helmsman upwind, and fatigue … All these parameters are taken into account . But this is all part of the charm of the Mini Transat. On these boats, where creature comforts are reduced to the minimum and where external sources of information are limited, the winner is rarely the one who has sailed the most accurate course. It is on the ability of the sailor to cope with all the technical and human elements that success usually depends. Such competitive issues do not necessarily affect those at the back of the fleet. Their goal is to arrive safely – in Sada and Lanzarote – even if they do not always take the ideal trajectory. 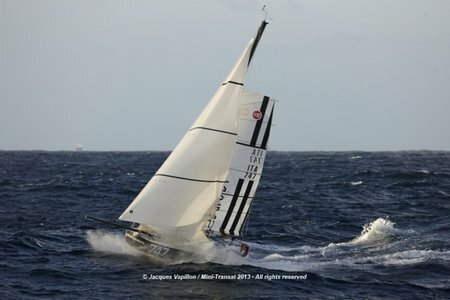 For a while there was some concern about the trajectory of Henrik Masekowitz (Merlin-soft-Sailing), but information received via one of the support boats confirms that all is well on board. It is the role of these watchdogs of the Mini heard to keep a close eye on their charges, to divert and investigate if a competitor is sailing an unexpected route and to check that the messages broadcast by the race committee have been received. Sometimes it is the competitors themselves who act as intermediaries. After the dismasting of Arthur Leopold Léger, Tanguy Le Turquais (Terréal Rêve d’Enfance) stood by until the arrival of the PSP Cormoran. In doing so, he dropped out of the leading group in the series boats. He should therefore benefit from the procedure to provide redress to a boat that has provided assistance to a competitor in difficulty. A golden rule that always prevails in ocean racing, making it a sport like no other. Meanwhile in Douarnenez, Stan Maslard (Sefico Group) has begun a race against the clock to check his entire rig. The technical turnaround time is limited by the race rules to 48 hours so the countdown has started.